Remember the Tegra Note 7? It was supposed to be an OEM platform from NVIDIA, but it got a bit overshadowed when the SHIELD Tablet came out. About a half-dozen manufacturers took NVIDIA up on its offer, notably EVGA, Zotac, Gigabyte, and HP, but it doesn't look like a second model is coming any time soon. Still, they're pretty nice little tablets, especially if you want one with a relatively clean version of Android and a built-in stylus for a low price. One of the other nice things about the Tegra Note 7 tablets is that updates come straight from NVIDIA (though HP's Slate 7 Extreme seems to be an exception). Multiple members of the Tegra Note Google+ community are reporting that they've received the over-the-air update to Android 5.1, so it looks like multiple models are being upgraded today. Check your system menu for a manual download - NVIDIA doesn't seem to go in for the usual staged rollout when it comes to software. The update is 446MB, surprisingly small for a full version bump. Other items in the changelog include updated features for the stylus, fixes for audio, display, and network problems, and app compatibility fixes. 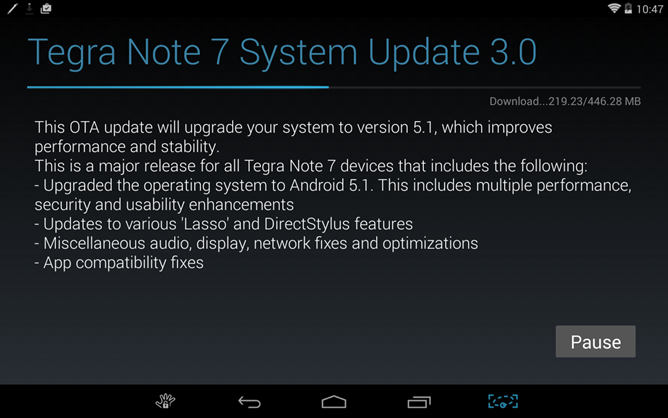 If you've got a Tegra Note 7, please let other users know if you're seeing the update, and which version (manufacturer) you have in the comments.